For the last several weeks, every time it seemed the market was ready to rally, something happened to send it back down. The biggest concerns lately centered on the potential trade war brewing between China and the U.S. It appears that most companies have no desire to get involved with a battle of escalting tariffs. Along with stock selling, we’re also seeing an elevated level of volatility (which is to be expected). What is somewhat surprising is how stubborn high volatility has been. There are simply not a lot of volatility sellers right now. That’s a major paridigm shift from the last three years or so, where selling volatiltiy was one the most popular ways to generate income. The blow up of certain volatiltiy ETPs is definitely contributing to the current demise of short volatility players. Generally speaking, retail traders do not appear to be shorting volatility nearly as vigorously as they were prior to February 5th (if they’re doing it at all). Of course, the lack of volatiltiy selling does not mean you should ignore the strategy completely. However, if you are interested in selling volatility, you may need to alter your approach a bit in order to lower your risk exposure. 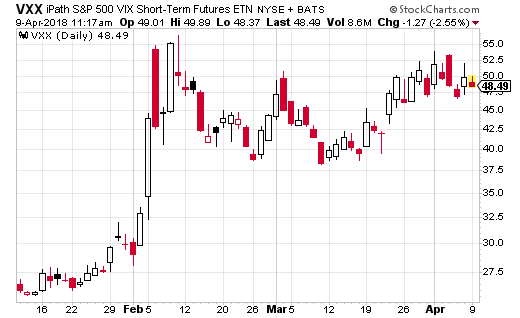 Take for example, a massive trade in iPath VIX Short-Term Futures ETN (NYSE: VXX) which hit the tape last week. Keep in mind, VXX is an easy way to trade the front two months in VIX futures and is far and away the most popular volatility ETP. The trade I’m about to describe is an alternative way to generate income while volatility is high. The trader sold over 22,000 June 15th VXX 76 calls for $1.26. VXX was trading around $48 at the time of the trade. The position generates income as long as VXX doesn’t climb above $77.26 by June expiration. If VXX remains below $76, at expiration the trade will collect almost $3 million in premiums. On the other hand, this trade has virtually unlmited risk. Above the breakeven point, the positions loses over $2 million for every dollar VXX ticks higher. While VXX it’s not very likely to shoot above $76, that’s obviously a massive amount of risk to take on. I never recommend selling naked calls – for any level of trader. Not only is the risk unlimited, the margin requirement for that type of trade is through the roof. Now, it’s possible this trader is long a lot of VXX stock and is completing the second half of a covered call position – but we don’t know for sure. Still, there are advantages to selling calls instead of buying puts to get short volatilty. By selling calls, you actually don’t need volatiltiy to go back down. All it has to do for your trade to make money is not climb above your breakeven point. But, instead of selling calls outright, I suggest using a call spread instead to cap your risk. For instance, we could sell the June 60-65 call spread (sellng the 60 call and buying the 65 call) for about $0.90. You limit your risk to just over $4 and you have all the way up to about $61 for your trade to be a winner. Below $60 and your trade generates $90 per spread. Since VXX isn’t likely to spike above $60 and stay there through June, this is a high probability method of generating income on volatility. And, selling calls means time works in your favor so you don’t have to worry about your options decaying like when you’re long puts. Are you looking for triple digit winners in your options trading? If you’re struggling to make options trading work for you and need some big time help in a hurry then check out my new options trading manual. It’s free for a limited time. Click here. The manual draws on the same powerful yet simple trading strategies I use every day for gains like those in my current streak of closing 10 double digit winners in a row at 21.8%, 18.1%, 14.5%, 17.6%, 15.8%, 15.5%, 18.3%. 25.3%, 10.2%, 14.5%… and that’s after an impressive string of triple digit winners closing at 127.7%, 213.4%, 147.8%. These are the kinds of gains that can turn your portfolio from struggling into a cash machine in almost no time. And the very same strategies used to achieve these gains are revealed in my new options trading manual. Click here right now for your FREE copy.